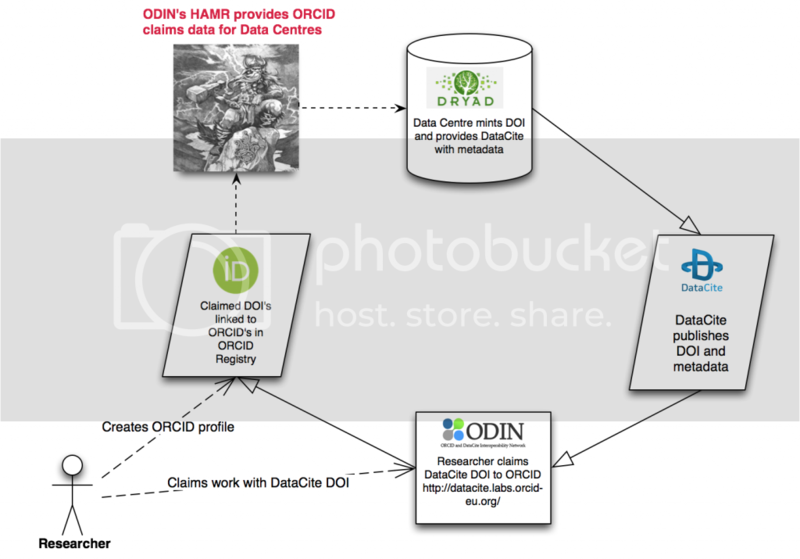 Introduction: In order to complete the “virtuous circle” of updates to DOI metadata, data centres need easy access to the information stored against their DOIs in ORCID. A service will be developed that allows a set of DOIs to be registered and monitored for changes of authorship within ORCID. The authorship information will be intelligently “diffed” against the DOI metadata and differences provided to the registrant. This could either be as a batch job, a query API or a human readable website. Prerequisites: Any of the following: Scripting or programming skills, experience with ORCID’s API, familiarity with DOI metadata, data-centre domain knowledge. Inspired by the initial Hamr prototypes developed at Code4Lib2011. Allow export of results to be compatible with different systems and metadata standards. 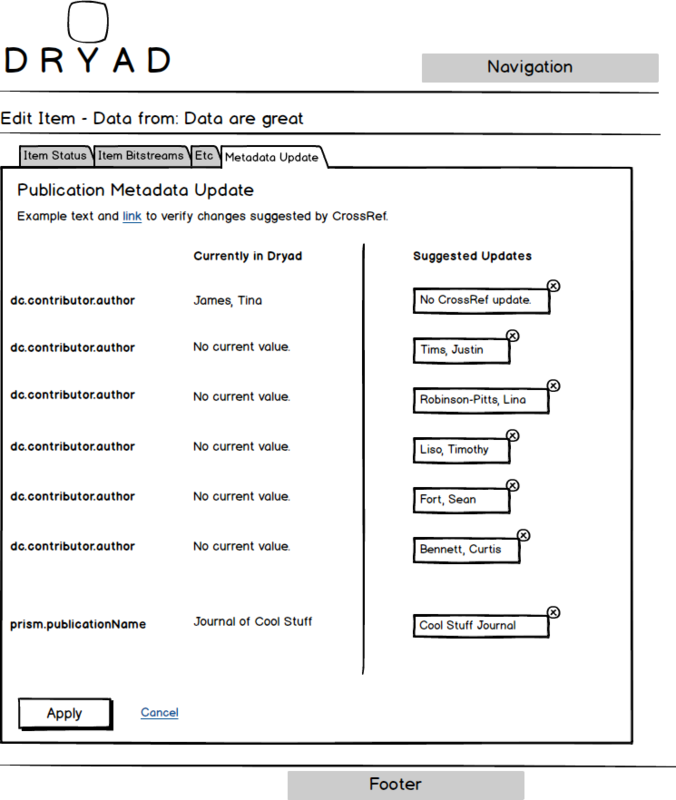 The initial implementation is as simple as possible -- a DSpace curation task that generates a CSV report of author names in Dryad matched with author names in ORCID. Code is currently available in the OdinsHamr.java file in the Dryad codebase. Broad use case for data repositories to obtain authors and ORCID's from the ORCID registry by searching by DataCite, CrossRef or other identifier. Odin's Hamr showed that we can use relatively simple techniques to get high-quality matches for our metadata. We can leverage the article-to-data relationships and add in relatively simple string matching to get highly accurate mappings. There are still not a huge number of Dryad items claimed in ORCID, but this tool can be used to continually update our links to ORCID as more researchers claim their works. relates to 441 Dryad Records (DOI's) out of how many? An experimental ORCID/DataCite Integration Network tool for comparing ORCID metadata across repositories. Goal: Starting with a DOI for dataset X in one metadata source (e.g. DataCite), retrieve from Okkam'sEntity Name System (ENS) ORCIDs (or other researcher IDs) available for each of the creators & contributors of dataset X from not only repository A but all other sources indexed within ENS. Report the score for each match to a secondary source. 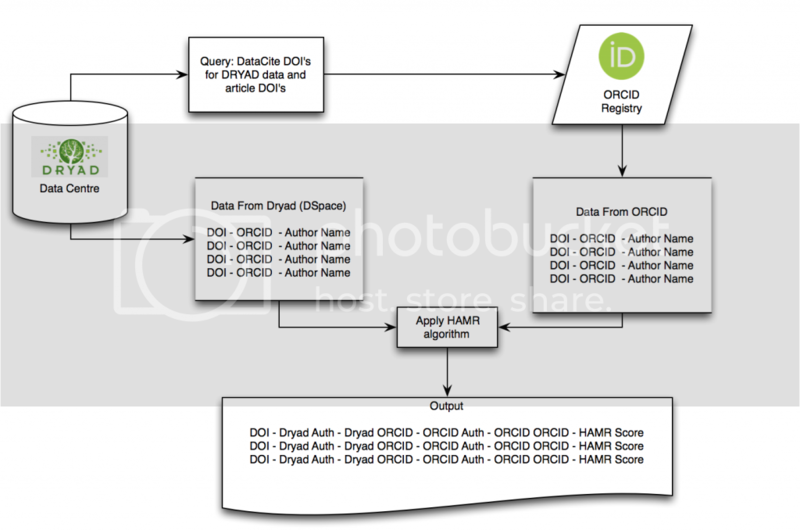 Justification: A data creator may have an ORCID or other researcher ID in the metadata of one system but not in another. A lookup will return all the places where an ORCID has been asserted for that person. authors associated with archived data packages in Dryad. This page was last modified on 16 December 2014, at 09:24.